Today is the zenith of the Harvest Moon. I have always been intrigued with the moon. I have the date & time of each full & new moon recorded on my lap-top calendar. The Harvest Moon is extra special. Since pre-history, Cultures all over the world celebrate it through dances, songs, special foods, prayers, and offerings. I thought I would do some internet searches to find out more about it, and do some celebrating of my own this year. I thought it would be fun for Emma and I to do our own small celebration. 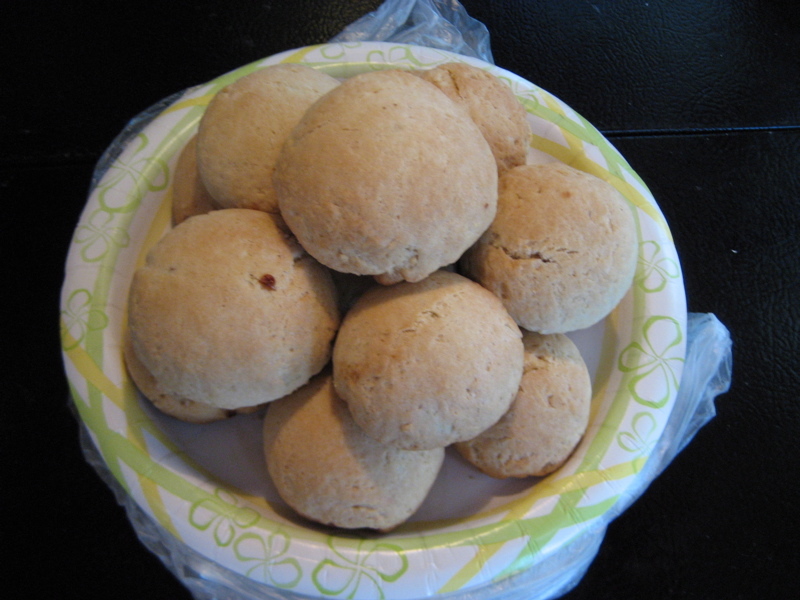 This morning we made full moon cakes. We are only eating things that are round today. We’ll watch the moon rise. Tonight we will play a game called “Capturing the Moon,” where we will try to catch our reflection in a bowl of water. It’s not much, but it’s fun and it gives us a little more insight & understanding into something that is greatly celebrated. People continually confront me with the fact that for over two years of full time travel I have never towed the Airstream. Their astounded tone of voice quickly turns to one of accusation and disdain. How could I not share in such an arduous task? (We have crossed this country seven times – that’s a lot of towing.) What if Rich were to get sick? What if there was an emergency? How would we survive if I can’t tow? In their eyes I am villainous! Most of the individuals who can not comprehend my refusal to tow have never traveled long distances with a child in the car. Most of them have never traveled full time while still working. None of them have been married to Rich. First and foremost, when we were conceptualizing our tour, I told Rich I would not tow and he accepted that fact. If my husband is OK with me not towing, then it doesn’t matter what anyone else thinks. I could end this post right here. But I won’t. You see, I’m feeling slightly self righteous this morning, so let me set the record straight! It’s not a matter of can vs. can’t, it’s can vs. won’t. I can tow. I won’t tow! Sitting in the front passenger seat, I am more than the driver’s travel companion, I am the other passenger’s travel companion as well. When we are in the car I help navigate, but mainly, I entertain Emma when she is bored. She was only five when we started our life of travel and hated being in the car, so this was a full-time job before she could read. She still hates being in the car, but now she can read to herself. DVD’s and GameBoy are strictly limited by Rich (not more than two hours of either in a day), so it still makes my interaction quite necessary. If Rich were in the front passenger seat, he would work on his laptop or talk on his cell phone, or he would try to nap. I would still be in charge of Emma’s dilemmas. When we arrive at our destination, I help to back in with hand signals. Rich sets us up outside, and I am responsible for the inside of the trailer. Once we are settled in, Rich usually goes right to work on the magazine. Our life is not 9 to 5. We are not retired. We are not on an extended vacation. The Airstream is our home, office, and classroom. I am Emma’s school teacher. I am her playmate – she has no siblings. I am always a mother and a wife. I am the one who prepares and cooks dinner and does the dishes. Rich can’t cook. I help Emma bathe and get ready for bed. My day doesn’t end when the driving ends. We have a clear division of responsibilities and my responsibilities do not include towing. 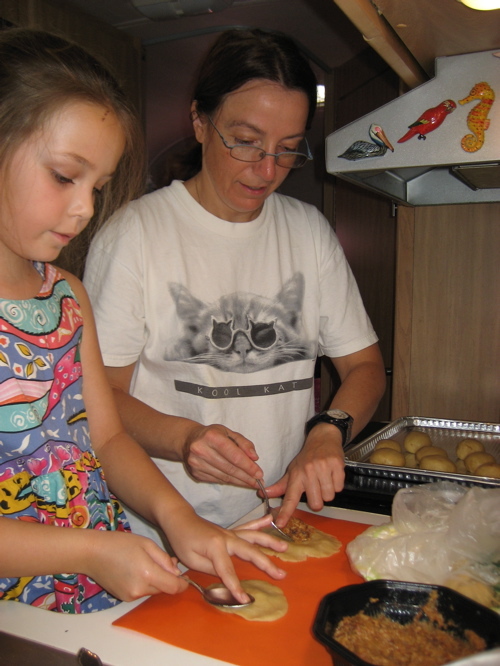 I love to cook Chinese, Cajun, Mexican, and Italian, making do with ingredients on hand. My kitchen is stocked with lots of infrequently used kitchen tools. What tools and appliances do you feel are a functional must for your AS kitchen? What basic items do you keep stocked in your pantry? Good to hear from you. Lots of people ask the same questions you just asked, so I think this time I’ll “blog” the answers. We don’t eat out a lot, but we are full-timers that travel around a lot. So, as we travel, I like to pick up local food items and cook with what I purchased. We always try to go to farmers markets and those little roadside stops that offer unusual local fare, like smoked fish, tangerines from 7th generation trees, garlic fried peanuts, or mutton tacos with a pickled serrano. What basic items do you keep stocked in your pantry? Fresh is best, so our refrigerator is always full. However, we gravitate toward out of the way places where diverse food items are not readily available. As a professional cook, there are certain things I refuse to do without. I love to cook many different cuisines, so I have way too much stuff in the “pantry”. Even though each thing is in small/single quantity, I still manage to fill four rubbermaid tubs, two overheads, and one cabinet. Rich complains that we have a trailer full of ingredients, but nothing to eat. What tools and appliances do you feel are a functional must for your AS kitchen? Now I need to be able to prepare and serve all those ingredients. As you know, storage space and weight are an issue, so I try to make sure that the things I have can serve more than one purpose. For example, the carafe of my 4-cup coffee maker is also used as a teapot, a pitcher, and a gravy boat. I didn’t bring my “best” cookware — too heavy and too large. But I don’t like “non-stick” aluminum pans, so I purchased a standard 7 pc. set of mid-weight, durable, stainless steel pans (by Wearever) with the sandwiched-disk style bottom. To this, I added my favorite “risotto” pan, and an 8″ fry pan with sloped sides. Our friend Brad brings his favorite cast iron skillet for “blackened” cajun dishes he loves to prepare. We also have a small “disposable” (good for about 12 uses) charcoal grill that we store in the outer compartment, and a step stool so Emma can operate at a proper counter height and I can see what’s in the back of the overhead compartments. I didn’t start our trip with all this stuff aboard. It is a 15-month culmination of things I decided I wanted to have along in my kitchen for comfort as well as function. To help you determine what should be in you kitchen, I can suggest this technique: Put what you consider your kitchen necessities out onto your counter, review each piece and see if any can be used for more than one purpose. Those are the “keepers”. Other items that are favorites or “must haves” are next, and so forth. You can cut a lot out with this type of process. Then find a place in your kitchen for everything you picked out – in order of importance. Make sure that the most frequently used or favored items are easy to access. Then cook a few meals in it. You will find that you missed some items, but also that you packed ones you didn’t use. Swap them out. I know there are things in my kitchen I could do without, but it would make cooking less fun, and I want to enjoy my kitchen — small as it may be. What I don’t like are those “RV Resorts” (and I use this term as loosely as the proprietors of said places) that offer the amenities of full hookup at the expense of nature. There isn’t a tree or shrub to be found and the closest thing to wildlife is the dog in the Class A 10 feet to the right. 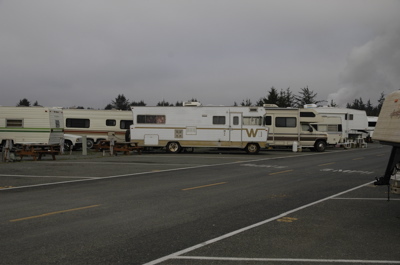 The goal of these “parks” is to cram as many RV’s as possible onto an expanse of asphalt next to a major highway near a major city and then throw in a laundry and club house so it can be called a resort. Is this a camping experience, or a resort? Neither. Don’t take what you just read in the wrong way. 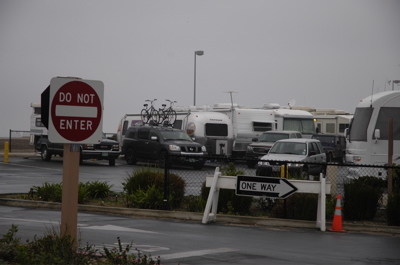 Some – albeit, too few – RV Resorts are what they claim to be – resorts. They offer restaurants, heated pools and spas, play areas for the children, some natural shade (though manicured and manipulated), a guest laundry, fitness center, gift shop and general store. They are basically a high end hotel where you provide your own “guest room”. The one we are at in Tucson offers all of the above plus patio furniture and a fruit bearing citrus tree at each of its 384 sites. Also a library, public restrooms & showers, propane grills, meeting rooms and a convention hall. The RV Resort we stayed at in Benbow, CA for Thanksgiving offered free WiFi, and its own 18 hole golf course. 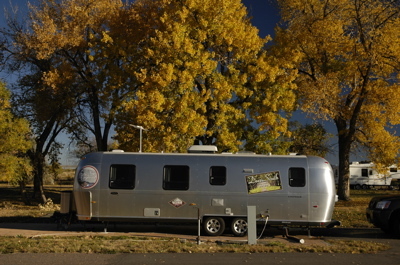 These are but two great places to stay with your Airstream if you desire what I call “the Ritz experience”. It’s obvious that for a lot of folks, this is exactly what they are looking for. But I don’t need or want all that these real resorts have to offer. Cherry Creek SP, CO offers full hookup and maintains an air of dignity. It is a great place to camp, with a huge playground, and a reservoir that allows swimming and boating. It has miles of walking and biking trails. Wildlife is abundant – we saw great horned owls, jack rabbits, mule deer, coyote, and magpie. All this in Denver! When we camped near Santa Barbara, CA at Carpinteria State Beach, our full hookup site was less than 50 feet from the ocean and even though we were parked on asphalt, we were also parked under trees. We had shade, the sound of the waves and a view of the water. 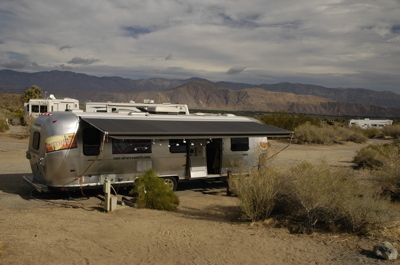 In Anza-Borrego Desert SP, CA the Palm Canyon campground is in the desert. There we had the benefit of evening Ranger talks, fabulous hiking, tons of wildlife including Big Horn Sheep and hummingbirds, and our full hookup site had palm trees, desert flowers, cactus and an incredible 360 degree view. Unfortunately, these fabulous campgrounds are few and far between. It is painful to acknowledge that more than not, the only full hookup campgrounds available are no more than a barren stretch of land with W/E/S. We have found ourselves in one or two of these places also, and having experienced both is why I think I abhor the latter so. You see, I know we don’t always have to give up the wonders that nature has to offer to be able to get the benefits that man can supply.